The new group continued to meet in Augusta, playing a significant role in the DOE discussion about certification for technology coordinators. In the forefront of this was Bob Stackpole, who acted as the chair of the group, Enga Stewart, then coordinator in Augusta, Jeanne Mukai from Skowhegan, Diane Wedgewood from Hiram, Bob and Diana Sommers from Wiscasset, and certainly others. At the quarterly meetings it soon became apparent that we wanted and needed more organizational structure, and so began several years of work to establish both a name, a constitution, and non-profit status. It was no easy matter to come up with “ACTEM.” At first there was much discussion of the distinction that needed to be made between technology education and computer technology education. That was finally settled by including both computer and technology in our name. Larry and Marylou Ryan (Wells), were most convincing in their work to avoid making the name of the organization too narrow. With a name settled, we next began work on writing a constitution with the goal of incorporation in the future. Bob Stackpole continued to chair the newly named ACTEM, with Liz Thayer serving as Treasurer. Liz also was the one to start some software reseller options, and part of the income ACTEM made on that went to compensate her for her time. The writing of the constitution took a long time and many meetings. Bruce Sawyer hosted a particularly productive constitution-writing session in Hampden and provided considerable help with language. The Constitution, adopted in 1995, has seen amendments added in 1997 and again in 2000, with by-laws adopted in 2001. Periodic by-law changes have been adopted through the years, the latest in 2012 involving the newly created title of Executive Director/Business Manager. In 1996 Bob Stackpole stepped down as President, having effectively nurtured the new organization through its early years. 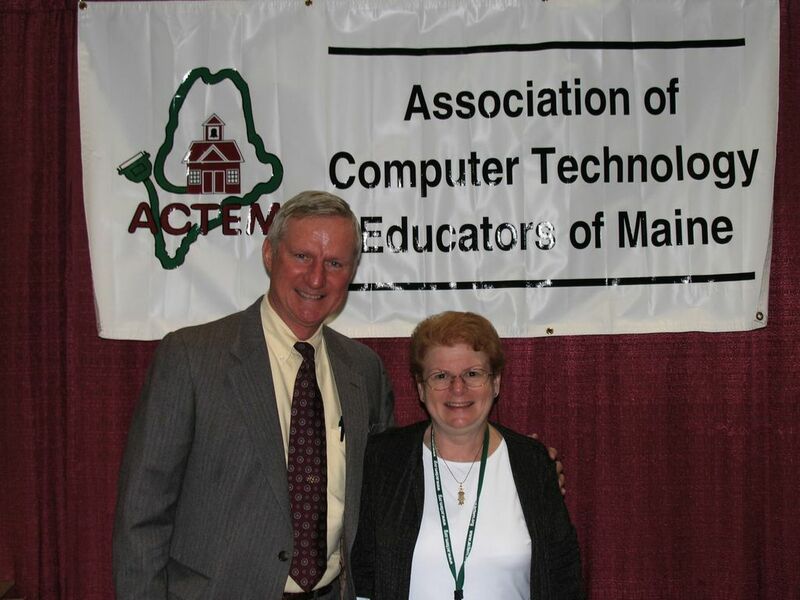 During his tenure, ACTEM evolved from a loose, informal meeting of local area coordinators into a state-wide association of both coordinators and others with an interest in K-12 instructional technology. At the 1996 annual meeting, held that year in Caribou, John Lunt assumed the ACTEM presidency and relinquished his position as President of MaineNet, a FirstClass email and BBS system hosted by the Maine Center for Educational Services that electronically connected a number of school districts throughout the state. In the years that followed, ACTEM continued the growth that was started by Bob Stackpole. The work that was begun on incorporation was finally completed under the direction of the new Business Manager, Betsy Caswell. The importance of the new Business Manager’s role in the association was formalized in the late 1990’s by establishing a contractual arrangement. In the years since becoming Business Manager, Betsy was always on the lookout for opportunities. When the Claris software reseller agreement was dissolved, Betsy pursued an agreement with Microsoft. In addition, working with the University of Maine, an agreement was concluded with Microsoft which provides ACTEM school system members with the maximum discount available on their products. This was only possible for Maine by combining the K-12 volume of ACTEM with the volume UMaine had at the college level. Business Manager Craig Dickinson worked with Kevin Carr of UMS to renew Microsoft agreements in 2006, 2009 & 2012. “ACTEM has been especially fortunate to have the strong support of Kevin Carr and the UMS System and the Orono-based Computer Connection managed by Derek Husson and assisted by Andrew Farnham,” Dickinson emphasized. One of the pressing interests of ACTEM in the 90s was wider name recognition. It was believed that the organization offered a great deal, but that too few people even knew it existed. To address that, ACTEM worked to secure affiliate status with both MEA (Maine Education Association) and with ISTE (International Society for Technology in Education). The MEA affiliation provided ACTEM with a forum distributed to MEA members throughout the state. The ISTE affiliation provides ACTEM members with a discounted membership and access to research related to technology in schools as well as the connection with a highly regarded technology association. A major turning point for ACTEM came with the transfer of the MAINEducation Technology Conference from the Center to ACTEM. Since 1997, when Bob Shafto “passed the torch” at the last conference presented by the Center, ACTEM has sponsored this conference, the largest K-12, educational technology conference in the state. It has provided ACTEM with a funding stream that has allowed it to do a great deal more toward the stated mission. This can be seen in the Technology Educator of the Year award(s) program overseen in the past by Jan Kolenda (Marancook) and Holly Smevog (Cape Elizabeth), and now by Alice Barr (Yarmouth) and Cheryl Oakes (Wells-Ogunquit), as well as in our appropriation of money to be used by ACTEM members for professional development. The work of developing and producing a conference the size of MAINEducation was tremendously eased by the many years of experience Betsy Caswell and Dennis Kunces had with the conference. The conference in the 90s got high marks by participants and vendors, many of whom remarked on the amazingly smooth running of the whole event. ACTEM was instrumental from the beginning regarding electronic communication between schools as well as putting technology to use in education. At one point, the organization absorbed MaineNet which was a network of Maine schools. ACTEM provided the server and became a primary hub allowing schools throughout the state to communicate electronically before Internet access was available. As with making the MECC software library available to Maine students before, ACTEM continued to live up to it’s mission by becoming a State Partner Organization of MarcoPolo. This program of free Internet Content for the Classroom proved to be a leader among its competitors for its extremely high quality partnerships whose content is worked into lessons freely available on the Internet. As the State Partner, ACTEM wrote and received funding for two grants, one to coordinate free MarcoPolo training throughout Maine, with the goal of reaching all schools in the state, and the other funding the coordination of the MarcoPolo lessons with the Maine Learning Results. Diana Sommers (Wiscasset) was the State Administrator for the training grant; Holly Smevog (Cape Elizabeth) was the State Coordinator for the correlation/web grant. After several years of trying to encourage students to design a logo for ACTEM and not finding one that reflected our association, we contracted with a graphic artist who worked closely with us to design one. The elements of the logo, the state of Maine, network cabling, and a schoolhouse reflected three key elements of ACTEM. In the 1990’s, recognition of ACTEM’s statewide representation came with an invitation to participate in the discussions which led to the creation of the Maine School Library Network. MSLN as it became to be called was the backbone of the network that connected a vast majority of schools and libraries in Maine to the Internet and put Maine out in front with this access. MSLN, and it’s successor, Networkmaine still allows the students of our state fast and reliable Internet access.